Check out our new friends Caleb Harve Davis and Ethan Cyr Osborne on Melon & Viggy's page and The Osbornes page! Originally uploaded by Trent & Mk. 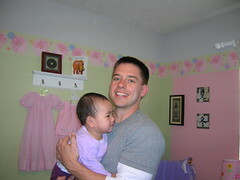 After a year and a half wait, Beth and Brian returned home from China with Addyson Grace this weekend. Click on the picture to see a few more pictures of Mk and I with our newest niece.